Veg-03, using the Veggie plant growth facility aboard the station, builds on the successes of previous studies. 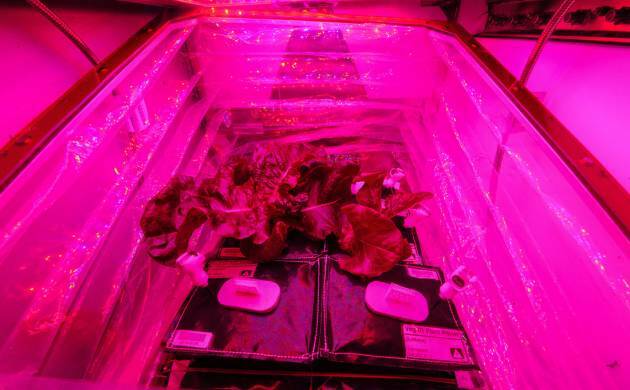 The studies include Veg-01, which resulted in the first-ever on-orbit harvest and sampling of fresh produce in 2015.
International Space Station (ISS) has been planted with lettuce by NASA. It is done to learn how to grow fresh food in space and it may also help prepare astronauts for future mission to Mars. The Veg-03 experiment was initiated by Nasa astronaut Shane Kimborough. This was one of his first science assignments as a new crew member aboard the orbiting laboratory. This is third on-orbit crop of red romaine lettuce by astronauts aboard the ISS, said NASA. The study is an approval of the tools and procedures that are necessaary to grow plants in order to provide fresh food for astronauts. Veggie team members watched from their consoles, as Shane Kimbrough worked in the Experiment Monitoring Area located in Space Station Processing Facility at Nasa's Kennedy Space Centre in Florida. Scientists watched Kimbrough's actions and ensure he did not encounter any challenges with the activity or hardware with the help of live video downlink. "Operations went great today! A little slower than expected, but all plant pillows were successfully primed for the first time in our Veg series," said Nicole Dufour, Nasa's Veggie project manager. Plant pillows are small pouches already containing a growth medium, fertiliser and seeds; astronauts add a little water to start them growing. "We previously have had some hardware issues that prevented at least one pillow from each 'grow out' from being successfully primed, so we were very excited to achieve that milestone," she said. "Once the plants are approximately four weeks old, a selection of leaves can be harvested for a bit of fresh lettuce and possibly science samples," said Dufour. "Meanwhile, some leaves are left intact along with the core of the plant, and will continue to grow and produce more leaves," she said. "We expect this will increase the on-orbit crop yield, as well as allow for more opportunities to supplement our astronauts' diets with fresh, nutritious food from the same plants, which is an important goal of the 'pick-and-eat' food concept," she added.